Apple, Google, Facebook: Whose Data Centers Are the Dirtiest? Apple’s iCloud is at the vanguard of personal computing. It also relies on a lot of dirty energy. You’ve heard about the Foxconn factory in China where your iPad is assembled. But have you ever considered the energy required to store your emails, photos, and videos in the cloud? As worldwide demand for data storage skyrockets, so do the power needs of the servers where all our digital archives live. While some companies (like Facebook) have made great progress in ditching dirty fossil-fuel energy for cleaner renewables, a few internet giants lag far behind. Climate Desk visited Maiden, North Carolina, for a close-up view of what will soon be one of the world’s biggest data centers—owned by Apple and powered by the coal-heavy power behemoth Duke Energy. UPDATE: A spokeswoman for Apple pushed back in a statement to Climate Desk after publication that the Maiden facility will be the “greenest data center ever built,” and released figures that dispute Greenpeace’s report. Greenpeace’s report estimates the facility will draw 100 megawatts of power. Apple says the facility will use 20 megawatts at full capacity, and is on track to supply more than 60 percent of that power on-site from renewable sources including a solar farm and fuel cell installation, “which will each be the largest of their kind in the country.” Suzanne Goldenberg from Climate Desk partner site The Guardian, quotes Greenpeace’s Gary Cook as remaining skeptical about Apple’s internal numbers: “I do feel that’s a bit of a lowball number. That would be a very empty building they are putting there in terms of power demand if it’s only 20MW. That seems disproportionally small,” he said. See a full-screen version here. To see how other tech giants stack up against Apple, look through the Greenpeace report here. To read about companies’ energy use, check out this table from Greenpeace’s report here. 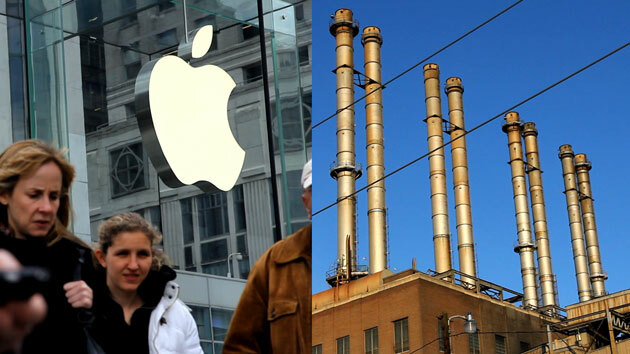 Learn more about how Apple powers its facilities in its 2012 Facilities Report. Learn more about Duke’s renewables development, emissions reductions, and more in its 2011 report. Check out these sweet aerial photos of the iDataCenter from Climate Desk partner Wired.